Sir Ben Ainslie is the most decorated sailor in Olympics history. As skipper of Land Rover BAR, the British entry in the 2017 America’s Cup in Bermuda, he won deserved plaudits from the green and sports worlds, for making environmental sustainability, in particular ocean health, a core value of his team. One thing Land Rover BAR did not win was the 2017 America’s Cup, despite spending in the neighborhood of £100 million ($USD135 million) over the four-year cycle. By some estimates, it will cost as much as 30 percent more to mount a legitimate campaign for the 2021 Cup, to be contested in New Zealand. So when British fracking and chemical company, Ineos, and its founder Jim Ratcliffe, offered Ainslie £110 million ($153 million) to fund the lion’s share of his 2021 America’s Cup quest, Sir Ben had a choice: Take the money and risk being labeled a greenwasher, or keep his good name and his well-earned global reputation as an eco-athlete among fans, his competitors, sponsors and more. 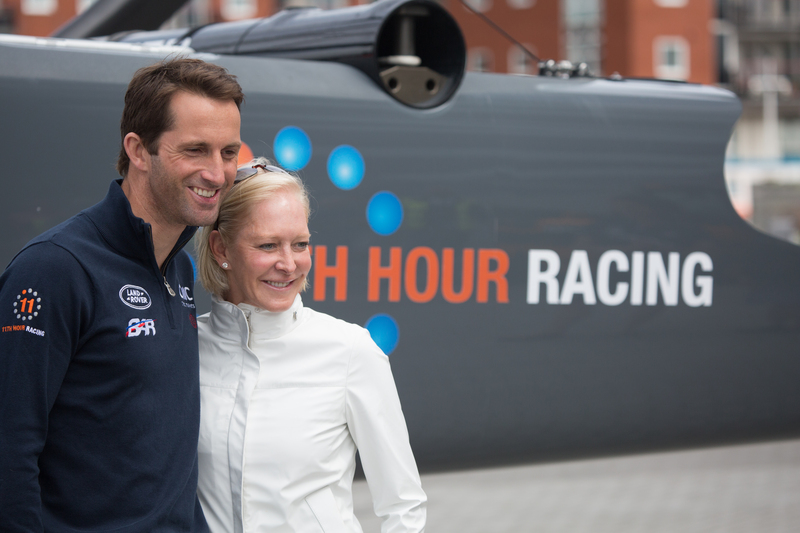 Since 2015, GreenSportsBlog has posted no less than 10 stories featuring Sir Ben Ainslie and his Land Rover BAR sailing team’s significant and substantive sustainability programs, including an interview with Sir Ben. I publicly lauded his and his team’s sustainability bona fides any chance I got. Sir Ben Ainslie is a greenwasher. Sir Ben earned that moniker with the April 26th announcement that his team had signed Ineos, one of the UK’s leading fracking firms, as title sponsor for its 2021 America’s Cup campaign. This was big news beyond merely the Green-Sports niche: The Guardian and CNN, among others, covered it. To get a sense of how stunning Ainslie’s 180 degree flip from eco-athlete to greenwasher is, one has to turn back the clock only two years or so. Land Rover BAR would not have been able to pull the above without its groundbreaking and close partnership with 11th Hour Racing. The Newport, RI-based organization partners with elite sailing teams committed to sustainable practices, providing them with financial, technical and other support. America’s Cup hopeful Land Rover BAR was certainly the organization’s highest profile elite sailing team partner. In addition to an annual investment estimated to be in the seven figures, 11th Hour Racing provided Sir Ben and his team with a wide range of sustainability-related services. And, after attending “Inspiring Sustainability Through Partnership,” a two-day, late 2016 program at the University of Cambridge sponsored by 11th Hour Racing, Sir Ben went even deeper, talking about the need for humanity to aggressively take on climate change. When one takes into account the depth of this quote and Ainslie’s massive global popularity (sailing is a very big deal in many countries, not so much in the U.S.), it’s not a stretch to say that Sir Ben was the most influential eco-athlete in the world. Last year at this time, Land Rover BAR and 11th Hour Racing were working together to bring sustainability to racing fans in Bermuda, site of the 2017 America’s Cup finals. But just a couple of weeks ago, Sir Ben announced he had ditched incumbent title sponsor Land Rover — which supported the team’s sustainability ethos in a number of ways — for fracking^ giant Ineos. As reported by Matthew Campelli in Sport Sustainability Journal on April 30, Ainslie’s partnership with 11th Hour Racing also is no more. While representatives of the organization declined to comment for this story, it seems impossible to imagine that 11th Hour Racing would have worked with Ineos Team GB. Pochman, co-founder Wendy Schmidt and the rest of the 11th Hour Racing team must feel gutted. The prospect of skippering Britain’s first-ever America’s Cup win clearly trumped Sir Ben’s (I guess not so deep) commitment to sustainability. And, with costs to mount a 2021 America’s Cup campaign expected to run as much as 30 percent higher as compared to 2017, money was an understandable concern for Ainslie. Until Ineos’ Jim Ratcliffe, recently announced as Britain’s richest man, stepped up with his £110 million offer, that is. Ainslie was quoted thusly by Martha Kelner in the April 26 issue of The Guardian: “The investment of Ineos leaves us with our best ever chance of bringing the America’s Cup home.” Allow me to translate that bland, press release-type language into what Sir Ben might have been thinking: Hmmm, with Ineos providing virtually all of my funding needs, I can focus on sailing pretty much 24-7. Land Rover and 11th Hour Racing won’t be able to cover our expenses by themselves so if I stayed with them, I would have had to spend valuable time selling more sponsors. And, if we end up needing additional funding, Mr. Ratcliffe can probably ring up his friends Charles and David Koch to sign on Koch Industries. OK let’s do this! In the same story, somehow, the depth of climate change knowledge Sir Ben expressed in late 2016 eluded him in 2018: “Fracking is not a subject I’m an expert on, but I know, having worked with Ineos for this partnership, that they take their responsibilities with the environment extremely seriously.” Translation: Climate change? Sustainability? I want to talk about sailing! Of course if — strike that — when we bring the America’s Cup home to Britain, all of this will be forgotten by my fans, the media, everyone. $217 million buys your conscience and your morals? WOW! The seas are murderously loaded with plastics and your sponsor is a plastics manufacturer who intends to turn the UK into a toxic teabag for fracked gas. You are clearly seeing the dollars but ignoring the two most important issues of life, environment and health. Please think about it. Ineos will pollute the ground. It’s not a safe bet for sponsorship. Ineos is a fracking company which brings significant challenges for ongoing public support for the team. But the sad truth is winning does cure pretty much everything, at least from a PR perspective. Many fans across all sports, from all corners of the world, excuse awful behavior from the favorite players, from domestic violence to tax fraud to PED# use, as long as they win. Sir Ben didn’t cheat. He didn’t beat anyone. All Ainslie did was play the fans, sponsors and media — yours truly included — who bought into his “commitment to sustainability” spiel for fools. All he did was make a mockery of his core values. And all he did was show his now two year-old daughter that he values an America’s Cup on the mantel more than clean oceans and a hospitable climate. Say in ain’t so, Ben. Innovation is fast becoming a Green-Sports watchword and it undergirds today’s GSB News & Notes: PyeongChang, South Korea, host of the 2018 Winter Olympic and Paralympic Games, will be the first to feature self-driving buses. Reebok will bring plant-based footwear to the market later this year. And Vestas, the only global energy company dedicated solely to wind, partners with 11th Hour Racing to bring a forward-looking sustainability message to the 2018 Volvo Ocean Sailing Race. South Korean telecommunications company KT Corporation plans to launch its next generation 5G cellular network in 2019. The Official Telecommunications Provider of the 2018 Winter Olympic and Paralympic Games in PyeongChang will use the quadrennial event to pilot the new technology. State-of-the art cell phones, 22nd century virtual reality devices and drone deliveries are only some of the 5G applications that will be on display at the Games. In concert with the South Korean Ministry of Science, ICT and Future Planning and partner companies Samsung Electronics, Ericsson, Nokia and Intel; KT Corporation will unveil self-driving shuttle buses in PyeongChang during the Games. The driverless shuttles, which will bring fans, staff and media from the city center to a variety of Olympics venues, are projected to reduce energy usage, greenhouse gas emissions and accidents vs. their human-driven counterparts. The athletic shoe and apparel industries are bringing innovative Green-Sports products to market at a breakneck pace. Nike’s new FlyKnit shoes cut waste by 80 percent. adidas recently-launched UltraBOOST Uncaged Parley sneakers are made from 95 percent plastic ocean waste. Reebok, a division of adidas, will join the greening fray by bringing plant-based footwear to the market later this year; an initiative the company says will create shoes that are “made from things that grow.” The first release will be a shoe that has an upper, the part that goes over the top of the foot, comprised of organic cotton and a base originating from industrially-grown corn (a non-food source). Reebok is partnering with DuPont Tate & Lyle Bio Products to create the “Cotton + Corn” shoes. The Cotton + Corn initiative impacts all three phases of the product lifecycle in textbook “Cradle to Cradle” fashion. In the development phase, Reebok uses materials that grow and can be replenished, rather than the petroleum-based materials used today. When the product hits the market, the company has ensured consumers that they won’t have to sacrifice performance and style. Finally, the plant-based materials in the the shoes are compostable at the end of the lifecycle. Reebok says it will take back used sneakers and compost them to grow the materials for the next batch of shoes. Bill McInnis, head of Reebok Future, told Environmental Leader’s Jennifer Hermes on April 5 that the plant-based shoes will be a bit more expensive to create at first than their traditional rubber, polyurethane, and synthetic rubber counterparts: the company is using new materials that it has not used previously and the small quantities at launch limit economies of scale. The Reebok Future team has been at work on this concept in various forms for over five years. According to McInnis, its focus is on “making more sustainable products and minimizing our environmental impact” that don’t compromise on quality so consumers will not be forced to choose between style, comfort and the environment. The price of the shoes has not yet been disclosed, according to Boston Business Journal. Global wind power company Vestas recently announced a partnership with 11th Hour Racing, to bring a strong sustainability message to the ’round the world 2017-2018 Volvo Ocean Race by their sponsorship of the American duo of Charlie Enright and Mark Towill. Before that, 11th Hour Racing, a program of The Schmidt Family Foundation which establishes strategic partnerships within the sailing world to promote systemic change for the health of our marine environment, will put sustainability front and center at this summer’s America’s Cup in Bermuda via its sponsorship of Land Rover BAR, the British entrant. The Vestas-11th Hour Racing-Enright-Towill campaign is a unique platform for the Danish company to promote its vision, which is to be the global leader in sustainable energy solutions. “Our partnership with 11th Hour Racing sends a very strong signal with two leading players within sustainability combining forces to promote sustainable solutions within wind and water,” said Vestas President and CEO Anders Runevad. The Vestas-11th Hour Racing sustainability message will start its circumnavigation of the globe with Enright and Towill when the race departs Alicante, Spain in late October. They then will travel 45,000 nautical miles with stops at Lisbon, Cape Town, Melbourne, Hong Kong, Guangzhou, Auckland, Itajaí, Newport, Cardiff and Gothenburg before the finish in The Hague.